Orange Cosmic Mermaid is unique, futuristic, eccentric, FUNctional high-energy fashion. We make wild, fun HOLOGRAPHIC shimmer clothes that emit fractal rainbows everytime the light hits them. The garments we make are show stoppers and have everyone intrigued by how bright they shine!! 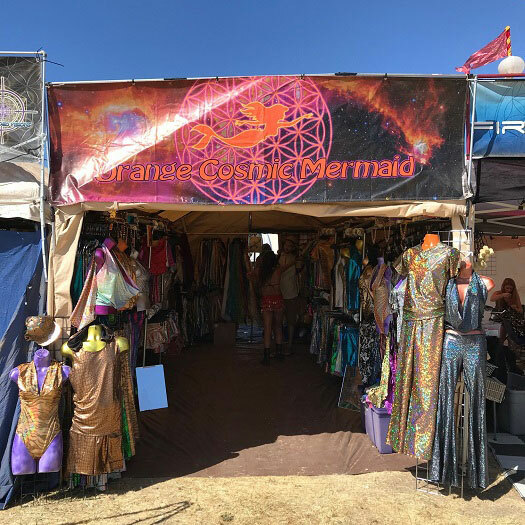 Orange Cosmic Mermaid is worn by everyone including world class international DJS, Models and celebrities!! We design and hand make everything ethically in LA to exude your inner confidence and playful self. After making all of our garments we reuse and re-purpose all of our scraps so we have zero waste! Not only are we zero waste but we also donate proceeds to ocean clean up efforts both locally and globally. We have removed 100’s of pieces of trash out of the ocean and continue to do so! These clothes are made to add a little sparkle to everyone’s life while making them feel comfortable in their own skin. We are inclusive and our garments are great for all genders, shapes and body types!! Our booth is a Sparkly, Holographic, High Energy FUN Friendly Haven!! All of our close emit rainbows like a light show that intrigues everyone while giving off that cosmic mermaid vibe! Not only do we have very sweet and sparkly staff but we love giving back and adding to peoples experience. We will do glam HOLOGRAPHIC Photo booth ops where people can try things on and get there pics taken and downloadable after the fest. Everyone can come enjoy and dance around in the sparkle haven! !